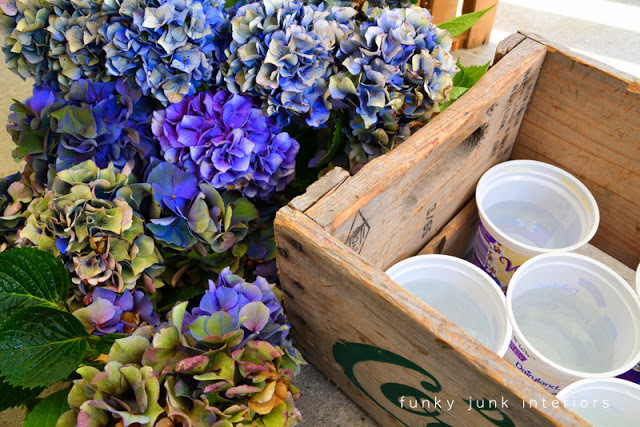 Party Junk 182 – hydrangeas! 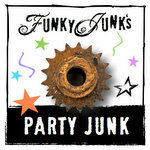 Welcome to Funky Junk’s Party Junk, a multi themed DIY link party! A hydrangea arrangement is always noticed, due to their incredibly abundant blooms. You will never have a weak eye catcher using them! Such as the case with this lovely yet simple arrangement in a sewing machine drawer. So cute! A fun and easy focal point by my front door last fall was an old curb side found dresser stuffed with crispy, fall hydrangeas. The bush needed pruning, so rather than throw the blooms away, I used them! I came about this tip by accident. I couldn’t figure out why one time my hydrangeas ran out of water, they they still looked like I had just picked them! And then I came across a post by The V Spot that explained why! Wow! 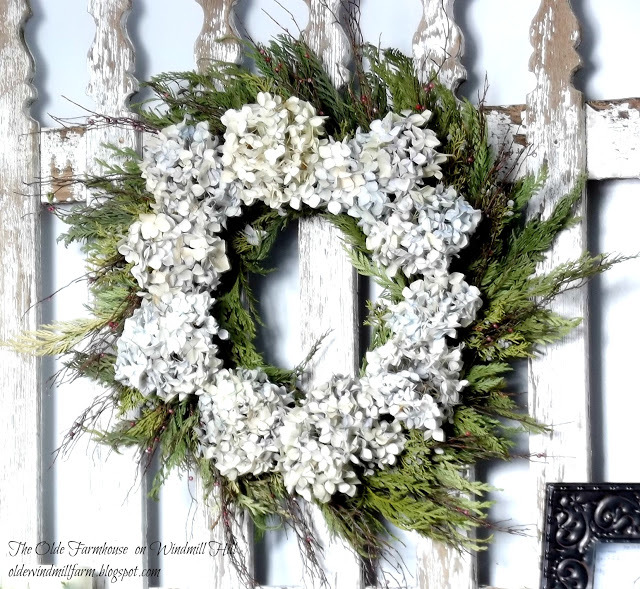 Making hydrangea wreaths are quick and easy! But this one caught my eye… I adore the layers and it really couldn’t be easier to whip up! 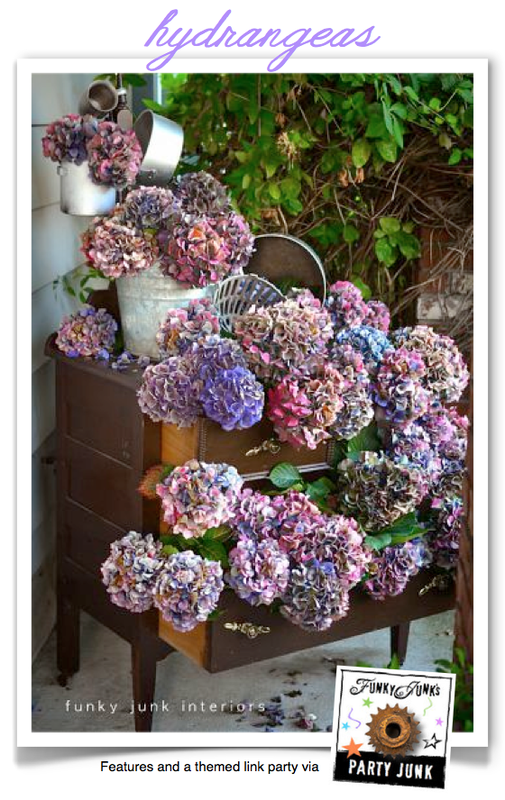 Check out these other FABULOUS hydrangea projects from my own curated favorites from HomeTalk! 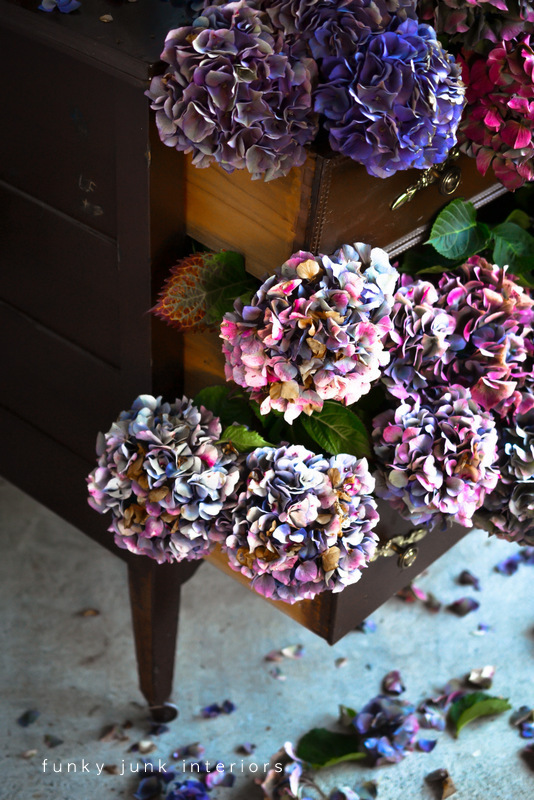 Share your own hydrangea themed projects in this weekend’s 3rd themed linkup! Thank you for another great party, Donna! Hydrangeas are so beautiful! I’m off to visit some links. Thanks for the party! Thanks so much for hosting Donna!! Hope you have a great weekend! Thank you, Donna, for hosting a party that last me a week of great links! I always appreciate your link party on the weekend. I really enjoyed your last post at the Garden Barn. So many good visuals…like taking us on a road trip. Thank you! Your blog design is fabulous, I just have to mention that before I thank you for the great links you provide here. I’m so happy to have something to link up this week! Love joining in Donna. This week my post is about possibilities but not the finished placement, gardening weather is just not ready for a rusty old Underwood nestled in the rocks, surrounded by moss (I have so much moss in my grass) and tucked in with colorful plantings. That is my dream not the current reality of a really great hunk of typewriter. Thanks for hosting Donna. I really like your Post a comment form – filling it in works so much better than google refusing to let me comment. Love joining in. Thank you for hosting, Donna! Party Junk 182 – new name. Sounds just right. Thanks for hosting Donna, love joining in. Gardening season and fence repairs for me. I love my Hydrangeas! I was so excited to see them starting to bud here in Northern California. I am loving all the beautiful projects using my favorite flower. Happy weekend! Thanks so much for hosting, Donna! Happy Friday! Thanks so much for the party Donna!!! 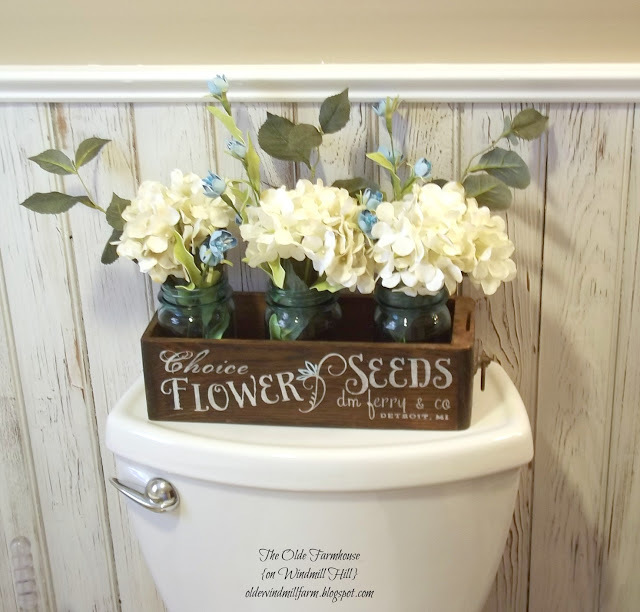 I am so excited to see my oil can hydrangea photo on your Hometalk board!!! Thank you so much for hosting again this week. Having a fun day with your son totally trumps setting your party post up! I’m off to do the same with mine today, so I’d better get off the computer and get to it. Ah! Another perfect Saturday evening rolling around – relaxing and enjoying all the links at your party! Thank you Donna for hosting; I always am excited when I am able to participate too! I’m SO late to the party, Donna, but just linked up and going to go visit around some. Thanks so much for hosting!